XBee devices allow you to enable wireless connectivity to your projects creating a network of connected devices. They provide features to exchange data with other devices in the network, configure them and control their I/O lines. An application running in an intelligent device can take advantage of these features to monitor and manage the entire network. Despite the available documentation and configuration tools for working with XBee devices, it is not always easy to develop these kinds of applications. 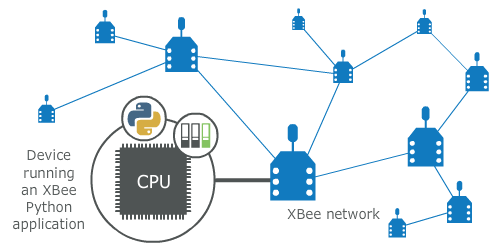 Support for multiple XBee devices and protocols. High abstraction layer provides an easy-to-use workflow. Ability to configure local and remote XBee devices of the network. Discovery feature finds remote nodes on the same network as the local module. Ability to transmit and receive data from any XBee device on the network. Ability to manage the General Purpose Input and Output lines of all your XBee devices. This portal provides the following documentation to help you with the different development stages of your Python applications using the XBee Python Library. PySerial 3. Install it with pip (pip install pyserial) or refer to the PySerial installation guide for further information about getting PySerial. Perform your first steps with the XBee Python library. Learn how to setup your environment and communicate with your XBee devices using the library. Access detailed information about the different features and capabilities provided by the library and how to use them. The library includes a good amount of examples that demonstrate most of the functionality that it provides. Find the answer to the most common questions or problems related to the XBee Python library in the FAQ section. The API reference contains more detailed documentation about the API for developers who are interested in using and extending the library functionality. Copyright 2017, Digi International Inc. This Source Code Form is subject to the terms of the Mozilla Public License, v. 2.0. If a copy of the MPL was not distributed with this file, you can obtain one at http://mozilla.org/MPL/2.0/. THE SOFTWARE IS PROVIDED “AS IS” AND THE AUTHOR DISCLAIMS ALL WARRANTIES WITH REGARD TO THIS SOFTWARE INCLUDING ALL IMPLIED WARRANTIES OF MERCHANTABILITY AND FITNESS. IN NO EVENT SHALL THE AUTHOR BE LIABLE FOR ANY SPECIAL, DIRECT, INDIRECT, OR CONSEQUENTIAL DAMAGES OR ANY DAMAGES WHATSOEVER RESULTING FROM LOSS OF USE, DATA OR PROFITS, WHETHER IN AN ACTION OF CONTRACT, NEGLIGENCE OR OTHER TORTIOUS ACTION, ARISING OUT OF OR IN CONNECTION WITH THE USE OR PERFORMANCE OF THIS SOFTWARE. © Copyright 2017, 2018, Digi International Inc. Revision 3297235a.